Madd Gear have been leading the way in what is graphically possible on a scooter in recent years and for the newest MGP VX8 Extreme scooters they are bringing more vibrant and fresh designs to the Limited Edition Extreme scooters. 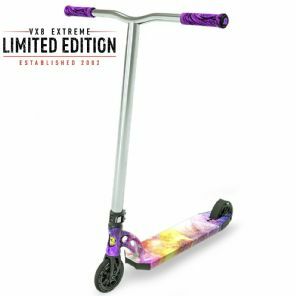 Utilising only the very best MFX components, the 2018 Limited Edition MGP VX8 Extreme scooters are going to be available as pre-order only and in very limited numbers so we recommend ordering early to avoid disappointment. Wider 4.8" deck to allow more foot space. 150mm Two-tone TPR grind grips. MFX X2 Cobra double clamp. MFX Affray 120mm 6061 T6 alloy fork.